To "Chip" or Not to "Chip" ? Is Microchipping a Safe Way to Ensure Your African Grey Cage Doesn't Sit Empty Long? Many veterinarians or bird owners advertise the safety and permanence of microchips, but are they really reliable or even necessary? “Microchipping” is a minor surgical procedure in which a device (a little larger than a grain of rice) is implanted into an animal to help identify it. Bird owners may choose to microchip their birds if they are worried about escape or theft. But not everyone agrees that this practice should be standardized, and it's clear that bird owners should research the procedure as well as its positive and negative effects before making a decision. Because birds are frail creatures, it is not recommended to microchip any bird weighing less than 100 grams. Conversely many experts feel that larger birds, like African Greys may be safely “microchipped.” The high price tag on larger parrots makes them a serious financial investment, thus owners of birds such as the African Grey need to consider whether to microchip as an added safety measure for ensuring a safe return to their African Grey cages should they be lost or stolen. 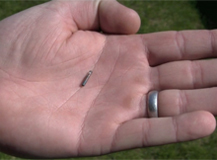 A microchip implant is basically an integrated circuit that is packaged as a tiny biocompatible, non-toxic, non-powered device. This electronic element uses a technology known as Radio Frequency Identification (RFID) to transmit its information and is typically injected with an oversized hypodermic needle into the pectoral muscle of a bird. Many veterinarians prefer to anesthetize the bird to ensure proper placement and bleeding control. These chips are specially made to encourage scar tissue to form so that they will remain at the injection site. They are guaranteed to last twenty-five years, but manufacturers claim they will likely last longer. Chip longevity is especially important for owners with larger parrots like African Greys, which can live long lives. The microchip contains a unique 10-digit alphanumeric code that can be scanned for identification purposes. When the need arises to identify a lost or stolen bird, animal shelter or veterinarians often have scanners that send out low-frequency radio waves that energize the microchip. If the bird has a microchip implant, then the microchip will send a signal back to the scanner, and the alphanumeric code and the name of the microchip manufacturer will appear on the scanner's screen. Animal shelters will then notify the agency with which the bird is registered and give them the code so they can look up the contact information of the owner. Ideally this identification process results in the reunion of bird and owner and a safe return to the African Grey cage. Escape is a real risk for birds. An owner might let his bird out of his African Grey cage for a little freedom, and an open door or window may invite exploration. Theft of larger birds is also common because of their high financial value. Microchips offer added security for owners who want to increase their chances of having a lost or stolen bird returned to them. Lost birds that have been socialized are likely to seek out another human when they are hungry. When the bird is returned to the shelter, the microchip can be scanned, which will identify the owner. If a bird is stolen and resold, then a microchip is likely to be discovered at a vet visit. Another benefit to microchipping is that it provides a safe and permanent identification alternative to leg bands. Leg bands can both cause and exacerbate injuries. They can cause chronic tendinitis and get caught on toys or other objects inside an African Grey cage or in an outside room. If a parrot hurts a banded leg, the band can worsen the injury by restricting blood flow in the swollen leg. Even the most careful bird owners cannot provide guaranteed protection either inside or outside of an African Grey cage. Microchipping eliminates the need for leg bands, and, according to some veterinarians, it is one step towards injury prevention. Although the risk of complications during or after implantation are low, some owners think that any risk outweighs the minimal benefit that microchips offer. Birds are much frailer than other animals that are frequently microchipped, like dogs or cats. Birds are easily stressed, and some owners do not wish to push a procedure that cannot guarantee a lost parrot will be safely returned to its African Grey cage. Owner vigilance is the most important layer of parrot protection, but microchips are also advertised as a secondary safety consideration. While the risks appear low, some owners may wish to avoid additional fees for a product that cannot guarantee safe returns. On the other hand, microchips offer a chance at some emotional or financial security that some large parrot owners value. Any bird owner considering microchipping should consult a veterinarian to discuss the benefits and risks. The BIG 3 Bird Behavior Links! Microchips offer an added layer of protection for larger, more expensive birds, such as the African Grey. 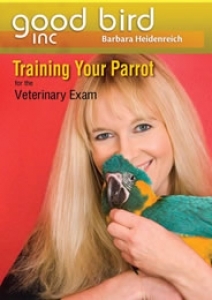 Once a lost parrot or larger bird is found, it can be taken to a shelter for a microchip reading. The microchip contains a unique code that will identify the location of the bird's owner so that it can be safely returned to its African Grey cage. Whether for microchipping or some other examination or treatment, preparing your bird to see a veterinarian is often an overlooked process by bird owners. Programs like the one above can train your bird to be more accepting of the appointment and any treatment, and make the experience much more pleasant for bird and owner.